Strategic Planning for Success: Defining a mission statement, setting precise goals, developing concrete strategies, and implementing specific actions to build your career. Time Management for Success: Quantifying time allocation, identifying challenges to time management, and creating a tactical plan to meet all deadlines for print and ebook publication. Tracking Data for Success: Identifying metadata for successful promotion of books and tracking those metadata across multiple books, series, and genres. Quantifying Career Success: Monitoring freelance income, recording business deductions, and tracking books sold. Specialized Issue in Successful Publishing: Executing rapid-release publishing for a series and creating and marketing multi-author boxed sets. 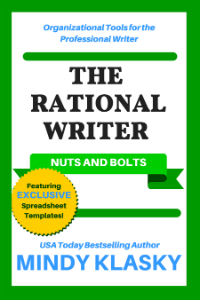 These documents were created specifically for purchasers of The Rational Writer: Nuts and Bolts. If you haven’t bought the book but you’re downloading the files, why not drop a few bucks in Mindy’s tip jar?